This layer represents Non-Potential Drinking Water Source Areas (NPDWSA), which are regulatory in nature, representing one of many considerations used in determining the standards to which ground water must be cleaned in the event of a release of oil or hazardous material. NPDWSAs are not based on existing water quality and do not indicate poor ambient conditions. The Massachusetts Contingency Plan (310 CMR 40.0006) defines potentially productive aquifers and within those, non-potential drinking water source areas. Determination of NPDWSA is detailed in MassDEP policy WSC-97-701. These documents should be consulted for details regarding the regulatory framework in which this data was created and in which it should be interpreted. To the extent possible with available data, this coverage geographically delineates NPDWSAs. The data layer can and should be used as one reference for determining NPDWSA status and appropriate ground water standards. However, this data set most likely contains errors of inclusion and exclusion. Conditions on the ground as specified in relevant regulations and policies supersede these delineations. 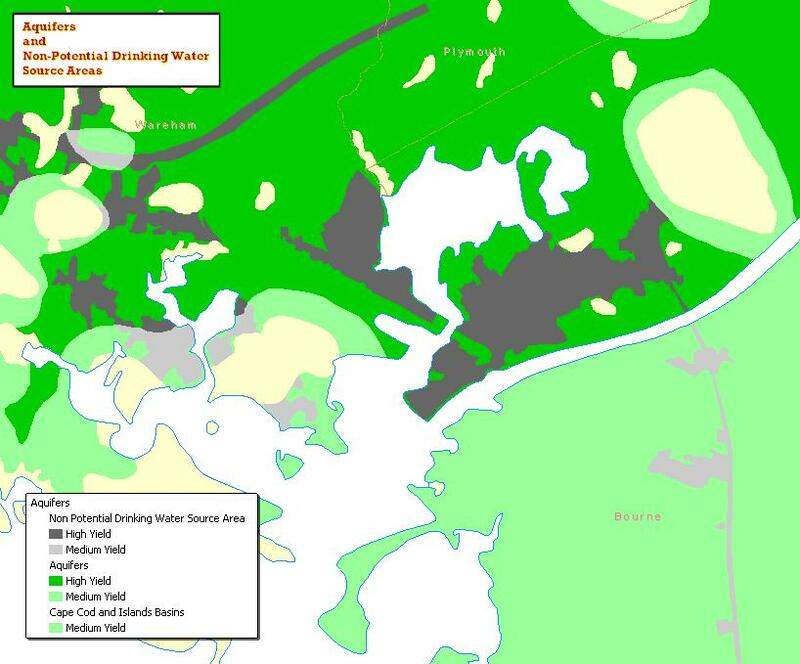 Prior to June 2003, the NPDWSA designations were included in the Aquifers layer (for non-Cape Cod/Islands areas) and the now-deleted layer NPDWSACC (for Cape Cod/Islands). The SDE layer name is NPDWSA_POLY. By definition NPDWSAs are portions of what would otherwise be Potentially Productive Aquifers (see the Aquifers layer). As defined in the Massachusetts Contingency Plan (MCP), a Potentially Productive Aquifer (PPA) means all aquifers delineated by the USGS as high or medium yield, and all aquifers located east of the Cape Cod Canal (Cape Cod), on the Elizabeth Islands, on Martha's Vineyard, or, on Nantucket. Within those areas NPDWSAs are defined either as having a population density > 4400 people per square mile as of the 1990 census at the block group level, or existing as a designated urbanized land use as of January 1, 1996. These land uses include: industrial, commercial, multi-family and dense residential (< 1/4 ac. lots), transportation and urban open areas. Areas meeting any of the above criteria must be at least 100 contiguous acres, though not all of that must overlay an aquifer. "Islands" of non-urban land use less than 100 acres in area, which are completely surrounded by urban land uses, are incorporated into the NPDWSA. Please see MassDEP policy WSC-97-701 for full details. Land use for the latest date prior to 1996 (1985 state-wide, and 1990-1991 for most of eastern Mass.) was consulted and all areas of designated urban land use were extracted. The extracted land uses were merged with Block Groups having dense populations as defined by the 1990 census. Internal polygon borders were dissolved out and the areas calculated in acres. Aggregated land use and census areas of less than 100 acres were eliminated. The remaining polygons were clipped to the limits of potentially productive aquifers. Islands of non-qualifying areas were identified using the Symmetrical Difference overlay method; their areas were calculated, and those having less than 100 acres were merged back with the other qualifying areas. Large islands were also manually checked for island inclusion and exclusion rules. Additionally, automobile and metal recycling land uses were manually selected from the land use data layer using aerial imagery from the period, as these are considered an industrial use, while excluding other "waste disposal" land use areas, which are subject to a different set of regulations. Further, places where the 1999 land use indicated additional urban areas were evaluated according to the best data available, often interpretation of black and white ortho photos from the mid 90s. The delineation of NPDWSAs in some cases also reflects additional land use information provided by municipalities. Because of the scale of available data as it relates to the natural characteristics of aquifers, a half-acre minimum mapping unit was adopted. NPDWSA polygons were overlaid with Aquifer polygons in an identity process to differentiate between areas of medium and high yield. The item TYPE was imported from Aquifers except for Cape Cod and the Islands it was calculated. While this attribute has no regulatory significance, it is used for cartographic purposes. With the June, 2006 update, the item CODE was removed as it was redundant with TYPE and is obsolete. Also, the item NPDWSA was deleted, as it was a vestige of when the layer was embedded within Aquifers prior to 2003. This layer should be displayed with the Aquifers layer and Major Basins (for the Cape and Islands) for proper and complete representation. Users should refer to the image above, which draws three layers - the NPDWSA on top, then the Aquifers layer, both symbolized on TYPE, and the Major Basins layer on the bottom with a query of BAS_ID = 22 or BAS_ID = 23 and symbolized with the color used for medium yield aquifers in the Aquifers layer (to display for cartographic purposes medium yield areas on the Cape and Islands not delineated as such). This datalayer is developed by the DEP GIS group. Distribution is through MassGIS. Minor updates were completed in November, 2003. A major review and re-development of this data layer was completed in June, 2006. One additional NPDWSA polygon was added in September 2012. The April 2016 update includes minor additions to two NPDWSA areas, one in Chicopee and one in Ashland. The land use in these areas qualifies under the MCP and were brought to the attention of the department by the responsible parties.